Magician Brighton. Edward Crawford is a full time professional magician working throughout Brighton and the whole of the UK. Magic has been his full time occupation for the past 15 years and in that time has become one of the most sought after entertainers in the UK. No matter the nature of your event Edward will have an act to suit your needs, guaranteed to keep your guests entertained with one of the astonishing performances they will ever witness. As a Brighton Magician Edward performs at a wide variety of events each year including weddings, balls, banquets, dinner parties, cocktail parties, trade shows and corporate events. He has a number of different acts depending upon the clients requirements including close up magic, table magic, a full stage show and a smaller dinner or parlour show for more intimate events. 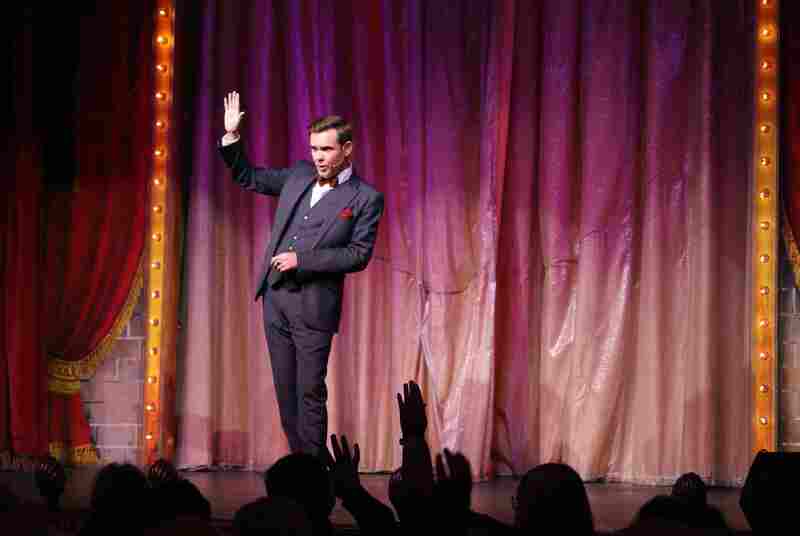 Edward performs a contemporary form of magic designed for a grown up audience. Combining psychology, deception, intuition and some trickery Edward will read minds, control the present and predict the future. Using magic of the mind Edward can reveal your thoughts from what you had for breakfast that morning to the name of your best friend at school, move objects with his mind, bend metal and make predictions of impossible to know events. This is the most genuine form of magic that will leave even the most cynical with a sense of wonder. If you wish to hire a Brighton magician contact Edward today on 07814 135569 or info@www.edwardcrawford.co.uk to discuss your event. With his years of experience he will be able to tell you the very best performance to suit your event and give you a price for your event. Brighton magician Edward Crawford is one of the few full time magicians in the UK and his stunning and original act is certain to leave you and your guests amazed, amused and astonished. You were absolutely fantastic and our clients loved every minute. I’ve been performing as a magician for 15 years now and full time for the past 10 years. Each year I perform at approximately 200 events throughout the year and have performed at pretty much every type of party, event and corporate do imaginable. In regards to private events I regularly perform at weddings, birthday parties, anniversary parties, once at a high class swingers party, very interesting! In this time the only type of event I haven’t performed at is a Bar Mitzvah. I’ve been asked to perform at many over the years but have always felt my style of magic may be inappropriate as they have been looking for a performer for children which really isn’t me. I’m always happy to perform for children at any event I’m at but generally my style of magic is far more suited to adults. Anywhere from the age of 12 upwards is fine but younger children are not entirely suited to the more psychological magic I perform. So last night I performed at my first Bar Mitzvah and it was a fantastic night. I was booked by the father of the boy having his Bar Mitzvah and he required a magician to perform at the tables whilst people ate performing for the adults and the children who would be in their early teens, a perfect age for me. The event took place at Sussex County Cricket Ground. I started the evening with a bit of a warm up, performing for people as they arrived for drinks. A common warm up for me is too ask people to think of a number, before they think of anything I write a number down. If I am correct in my judgement of the person the number I write down is the same as what they are thinking of. I then take this a little further and ask them to think of a couple of numbers of their pin number. I tell them the numbers! I only go for a couple of the numbers in the pin numbers as I don’t want them to worry they might have to go and change their number the next day! Happy to say I had a 100% success rate last night. I performed for people whilst they drank for about an hour, they then went in to eat. During this period I performed at the tables giving each table a 10 minute show, taking the mind reading and predictions much further. I ended the evening by performing a special routine for the parents of the boy having his Bar Mitzvah. It was a fantastic evening with a really lovely group of people who I had so much fun performing for. As I write this I’ve just had an e-mail from one of the guests. They wrote, “We saw you last night at the Bar mitzvah and thought you were amazing! We spoke to you about the possibility of performing at our upcoming wedding. We just wanted to know if you were definitely free that date We would want you to perform like last night going to each table during the meal”. Always a wonderful feeling to get such positive feedback and more work. I want to thank everyone at Sussex Cricket Ground for their help, a wonderful venue A massive thank you to Steve for the booking and Mazel Tov to Sam. My first Bar Mitzvah was a lot of fun and I hope to perform at many more in future. If you’re looking to hire a magician in Brighton whether for a table, close up or dinner show contact me on 07814 135569 or email info@www.edwardcrawford.co.uk for more details. On Saturday night I was hired to perform close up magic at a private event in Brighton at the luxury Ocean Heights apartments. The event was organised by the builder and developer of the apartments to celebrate selling the last of the flats. The flats are overlooking the marina and the event took place in the stunning penthouse. The guests included people who had purchased the apartments and the builders and people who had worked on the building, all together there were about 50 guests. The event was a very relaxed drinks party which allowed me to casually mix and mingle with the guests performing for small groups at a time. I started the evening performing a 10 minute routine for each group which involved close up magic of a psychological nature, making predictions and reading minds. It took about an hour and a half to get around everyone and spent the rest of the evening (I had been booked for 2 hours but ended up staying for about 3) being called over to groups of people who were asking to see more. At this point I could take things further performing some more in depth mind reading and a number of my favourite routines which I only get the chance to perform when I have additional time. It was a really fun evening with a really lovely group of people and I was very pleased to receive another booking for a wedding later in the year. I also managed to get some free building advice from one of the builders! Thanks to Jerry and Tania for the booking. If you want to hire a Brighton magician for your event please get in touch. On Saturday night I was hired by Rockwell Colins, the multinational aerospace corporation to perform at their annual New Years Ball for their staff and families. This is the first of two events for the same company with a second coming up next week in Ascot. This was my first show in a couple of weeks after a hectic Christmas period, 30 shows in 20 days. Things always slow down rapidly in January which usually gives me a weeks holiday and time to work on new material, scripting new shows etc. There’s a trick I’ve had in mind for months now and this was the perfect opportunity to give it a try. Due to the psychological nature of much of what I do, it can be impossible to try this stuff on family and friends so when I want to try something new for the first time I just have to go out and try it, always nerve wracking. Especially at such a lovely venue as the Brighton Grand. The first part of the night was a drinks reception and I stuck to a standard pattern here. Performing close up for small groups of 3 to 5 people, showing each group a five to ten minute routine. The second part of the night called for table magic. Each table had a unique 10 minute routine, including all the guests in the various tricks. At the end of the night I went back to one of the tables to try out my new routine. It’s very hard to describe but it involves dowsing with a pendulum and reading peoples emotions. It went down a storm and I can see this particular routine becoming part of my regular show, just need to hone it over a few hundred more performances until I’m 100% happy with it. The whole night was a huge success and I look forward to performing for the company again next week. 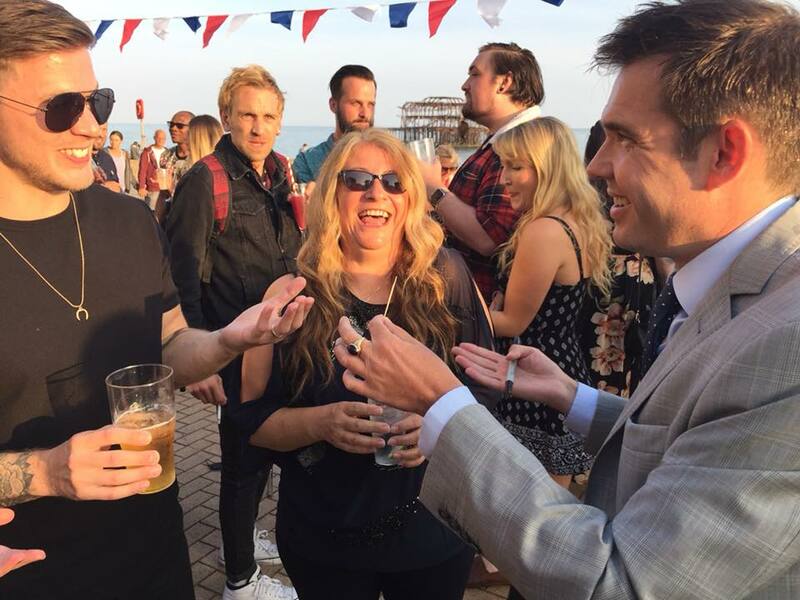 If you’re a after a Brighton Magician to perform at your corporate event please get in touch.